Classic, Greek Fisherman's cap cabbie golf cap hat with braid rope embellishment & side cool metal tone button on each side. Interior sweatband, no lining for cool comfort. Elastic back. Great quality head wear. Great for all seasons. Vacation or resort wear or a night on the town. 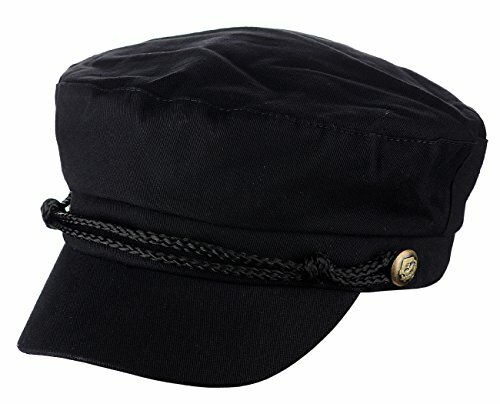 Occasion: Iconic Greek fisherman's chauffeur cabbie driver golf flat hat cap. Perfect for a day in sun, everyday wear, a day or night out on the town, sailing, outdoor picnics, derby, boating all outdoor activities for sun protection. Formal attire, wedding, cocktail party, church and religious gatherings. Fiddler on roof performance. Kentucky Derby, horse races, charity events. Perfect for vacation and cruise attire. Will compliment any outfit.